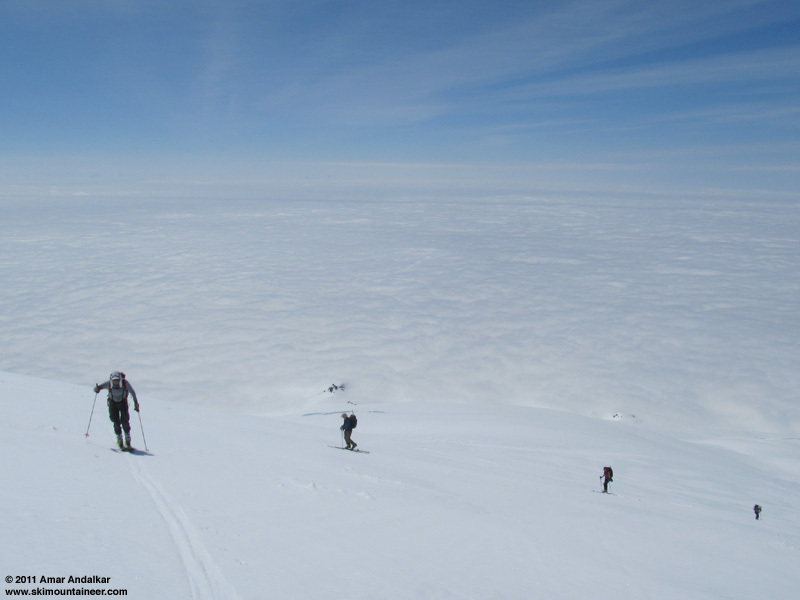 Summary: Completed a full ski ascent and descent of Mount Baker via the Squak Glacier route, from a mile before the trailhead to the summit, requiring about 7900 vertical feet and roughly 18 miles roundtrip of skinning and skiing right now. The road is free of snow and driveable to 2900 ft, about 2 miles from Schriebers Meadow trailhead, then mostly snowcovered 1-2 ft deep for the next 1/4 mile, then entirely snow-free for about the next 3/4 mile, and almost entirely snowcovered for the last mile beyond that. 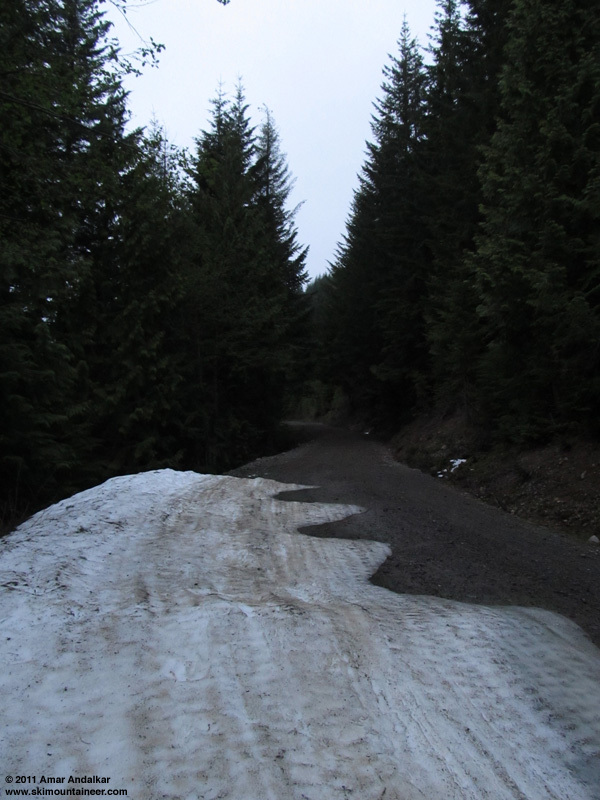 Although a big change from 11 days earlier (see May 29, 2011, Mt Baker, Easton Above the Clouds), when the road was blocked 2.7 miles out but was almost entirely continuous snow from that point onward, it's not necessarily a change for the better. It might be best to wait until the road is driveable within 1 mile of the trailhead and at continuous snow (maybe a week or less? ), instead of having to walk so much bare road right now. 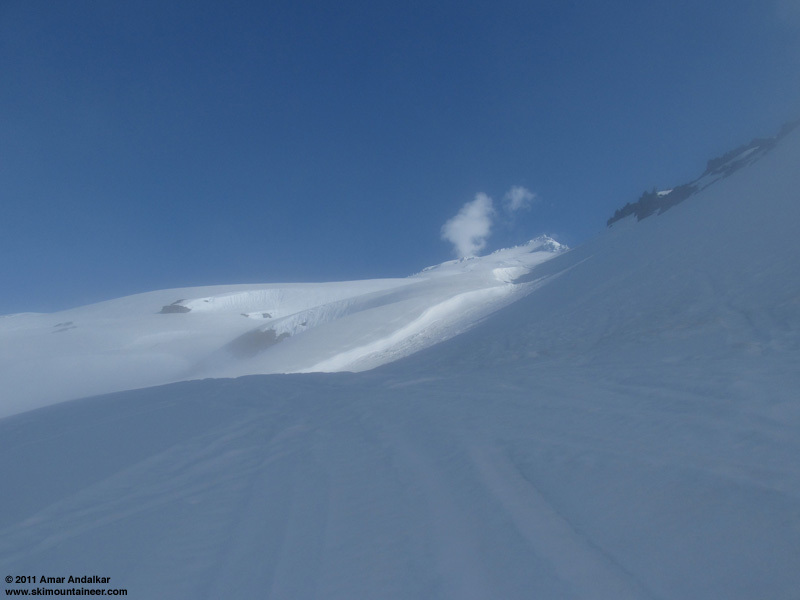 Three-shot panorama of Sherman Peak and the Squak Glacier from 6500 ft just north of Crag View, with a steam plume rising above Sherman Crater and Mount Shuksan visible above the 6100 ft cloud deck at right. The crevasse conditions on the Squak route are very good, with only a few incipient cracks barely starting to show in the usual steep rollover from 8700-8900 ft. Snow conditions were excellent up high, smooth proto-corn and corn on the Roman Wall with no ice even on the summit dome, but deep unconsolidated glop below that from 9000 ft down to 6000 ft. Snow stability on this moderate-angle route was very good as expected given the terrain, nothing moved or slid at all during the day despite the deep mush, but we were careful to avoid steep rollovers below 7000 ft which might have slid or sluffed. Just a beautiful day of sunshine and near-calm winds up there, above a thick cloud deck which rose throughout the day from about 6000 ft up to 7000 ft, but which was joined in the afternoon by a second upper cloud deck which whited out the summit area above 10000 ft. Unusual to be skiing in bright sunshine between two cloud decks, perhaps the first time I can recall doing that. No snowmobiles were seen by us all day this time, although a few were heard briefly far below us in mid-morning. At day's end three trailers were parked at snowline on the road, so a half-dozen snowmobilers had traversed the 3/4-mile bare stretch of road to go wherever they went this day. 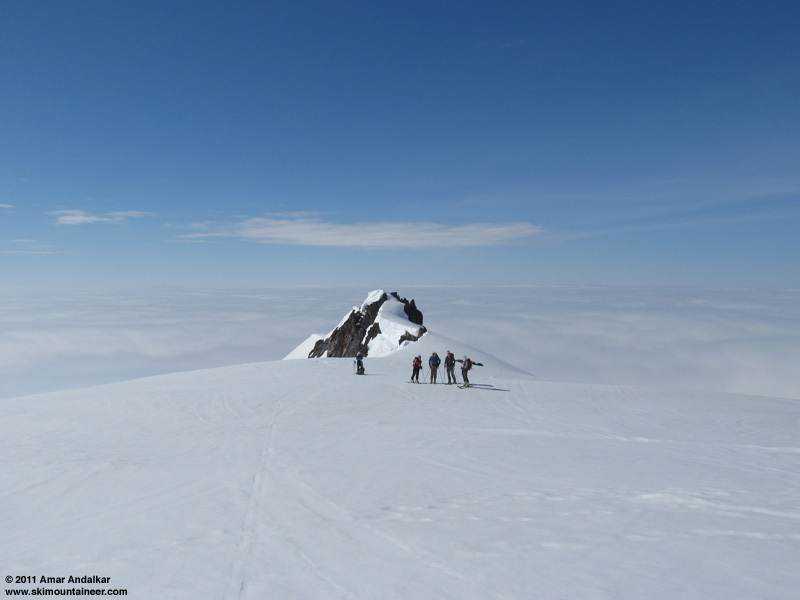 Details: As of Wednesday morning, the NWS forecast looked decent for Thursday, partly sunny with a snow level of 9000 ft, so six of us (Khanh, Tobae, Tim, DaveZ, and Daniel) decided to take a chance and head for Mount Baker, it would be their "annual Squak Glacier trip" for most of them. The forecast grew worse with the afternoon update (mostly cloudy with a chance of showers -- just like most of spring 2011), and the UW weather model was ambiguous as to whether the weather would be nice up high above a cloud deck. I almost stayed home, but decided to drive to the trailhead late Wednesday evening and join the others, who were parked 2 miles from the trailhead where the road was blocked by snow. Uh-oh: no more snow, only 8 minutes after starting to skin at the car. We set off at 5am under cloudy gray skies, starting on skins for a bit, only to be disappointed when the snow ended completely after about 1/4 mile. Nothing but bare gravel for about the next 3/4 mile, then finally back on solid and continuous snow far the last mile to the trailhead. Still about 5-6 ft of snow at Schriebers Meadow trailhead, but the restrooms are open and useable. We headed up the old logging road (not shown on maps) behind the horse campground, which switchbacks up the recovering clearcut a few hundred vertical feet upslope to near the Scott Paul Trail. The trail is impossible to find or follow, so we followed near old snowmobile tracks heading generally up the slope until arriving at treeline. 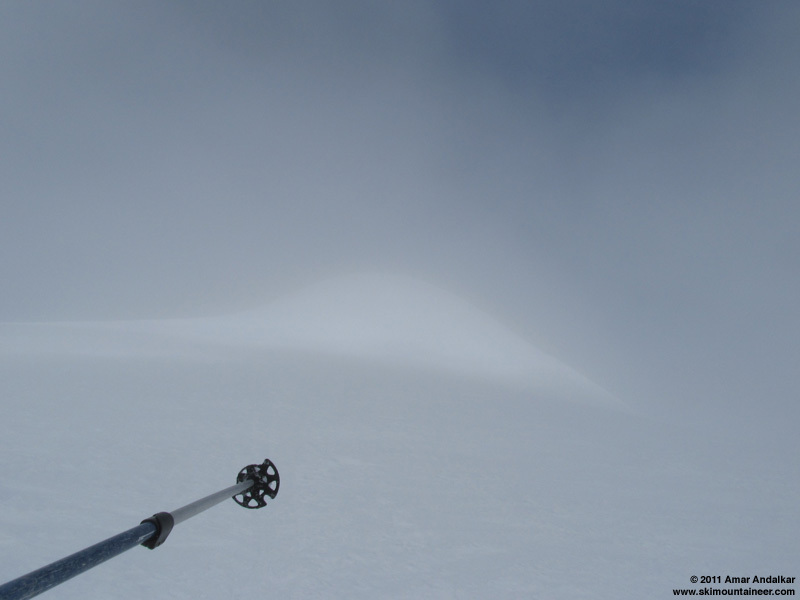 By the time we reached the open meadows above 5000 ft, we had also moved up past the bottom of the cloud deck and were navigating in a foggy whiteout. 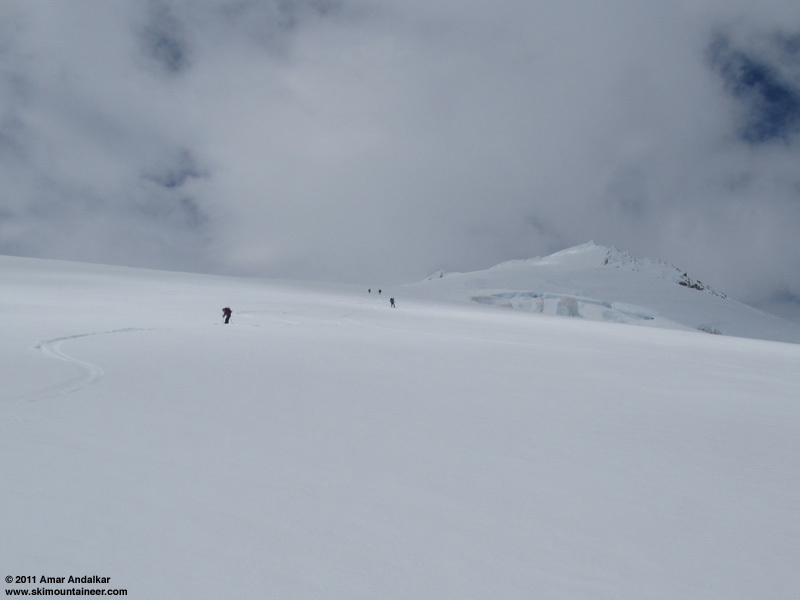 We reached the standard traverse spot onto the Squak Glacier at a cairn near 5900 ft just SE of Crag View, but the slope is a steep sidehill and covered in mushy wet snow, which we feared might slide. We made a brief attempt at a downward-angling traverse, but gave up since we could not find a safe spot in the whiteout. We had no idea how far up the cloud deck extended, or whether we would ever break out above it into sunshine, and group morale was low. I suggested going the other way instead, traversing around the west side of Crag View, and turned on my GPS as we set off that way, so that we'd have a track to follow back to the cairn if needed. But amazingly, as we rounded the west end of Crag View and neared 6000 ft after several minutes of traversing, we saw hints of blue sky. By 6100 ft, we had arrived atop the cloud deck, almost 4 hours after leaving the car, with much of the last hour spent wallowing slowly in the whiteout. We were totally stoked. Looking up at Sherman Peak, through thinning fog at the upper edge of the cloud deck. The snow quickly went from mushy mank to solid frozen crust as we neared the edge of the cloud deck, with radiational cooling overnight allowing a solid freeze above the clouds, at least of the upper several inches of the snowpack. Some in the group added ski crampons, others didn't, as the crust had a very grippy texture with decent traction. The group at 6450 ft in front of Crag View, overjoyed to be above the clouds at last. The next 4 hours were a blissful cruise up the gentle glacier in bright sunshine and calm air, the smooth surface marred only a by a few snowmobile tracks. 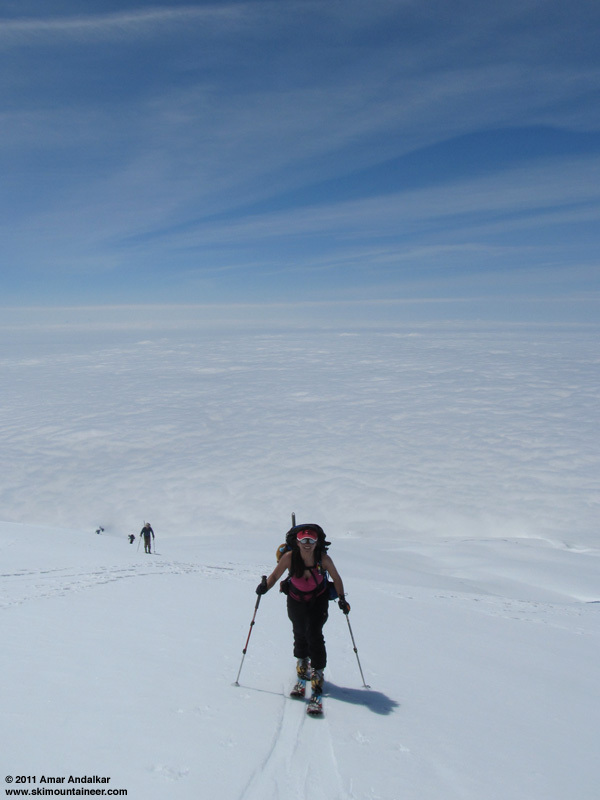 We kept a relaxed pace, as the 4 of us who had skied Rainier over the weekend were still feeling some lingering tiredness 4 days later. A long break at 8000 ft was very welcome, and I nearly dozed off laying atop my pack. Skinning up near 9000 ft, with Crag View still visible far below. As we neared the steeper roll near 8700 ft, we cut a tighter set of switchbacks between some incipient cracks, which were actually somewhat scary given the increasingly mushy snow (the morning's crust was long gone at this spot by 11am). It looks like this area will soon break up and become quite hazardous, much earlier than last year. There is usually a decent way to end-run the entire area, though, if you remember to angle way left by 8500 ft, well before the slope steepens. I assume this strategy will work this year too, but there's no way to see if it works from below as you skin up the route. We took another break to melt some water on the Jetboil at 9500 ft where the Squak route joins the Easton route, as we were running a bit low given the intense sunshine and lack of wind. The view up towards Sherman Crater and the Roman Wall was outstanding, with a large steam plume still rising vertically out of the crater. Skinning up from our break spot at 9500 ft towards Sherman Crater and the Roman Wall. Most members of the party preferred to boot up the Roman Wall in the existing bootpack, which turned out to have been badly damaged by a descending party of 9 on foot a couple of hours earlier. I love to skin whenever possible, and guessed that the warm sunshine had softened the wall enough to easily do so. However, all traces of any prior skin track (such as ours from 11 days earlier) had vanished with recent light snowfall and strong sunshine. I set a new skin track switchbacking up the steep slope in ideal conditions, 1-2" of softened snow well-bonded to a firm base, no slipping or sluffing at all, and ski crampons not needed either. Only Tobae chose to follow the skin track, thanks for making it be useful. 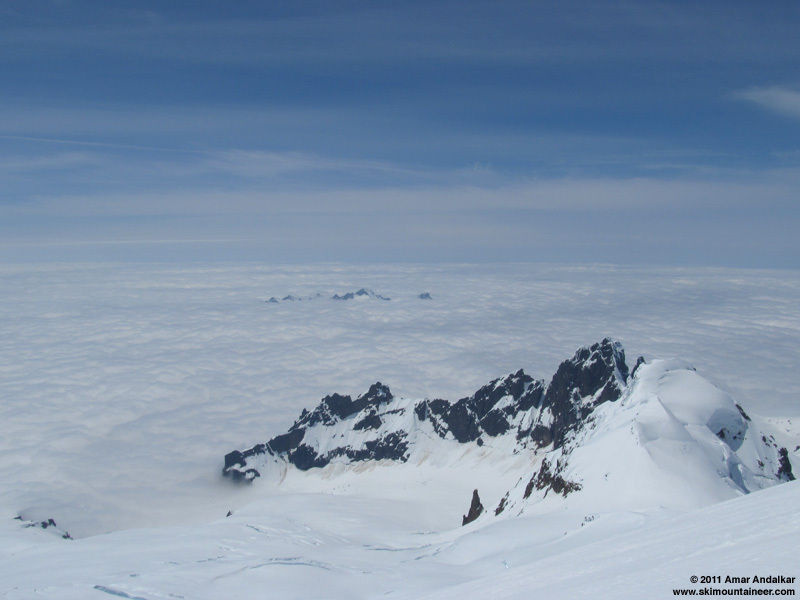 Looking down from high on the Roman Wall, with Deming Glacier and the Black Buttes below, and the summits of Twin Sisters Mountain peeking above the sea of clouds. Unexpectedly, as we neared the top of the Roman Wall at 1pm, a second cloud deck began to form overhead. Less than 5 minutes after the previous photo was taken, the cloud deck engulfed us and hid the Black Buttes from view. This cloud deck was forming despite winds that were nearly calm (under 5 mph), so it was not a lenticular in any way, shape, or form. Just weird for an entire deck of clouds to materialize from clear air. Mountain weather, and Northwest weather, never ceases to surprise. Quite a change only 5 minutes after the previous photo: a second cloud deck has suddenly formed overhead and we're ascending right into it. 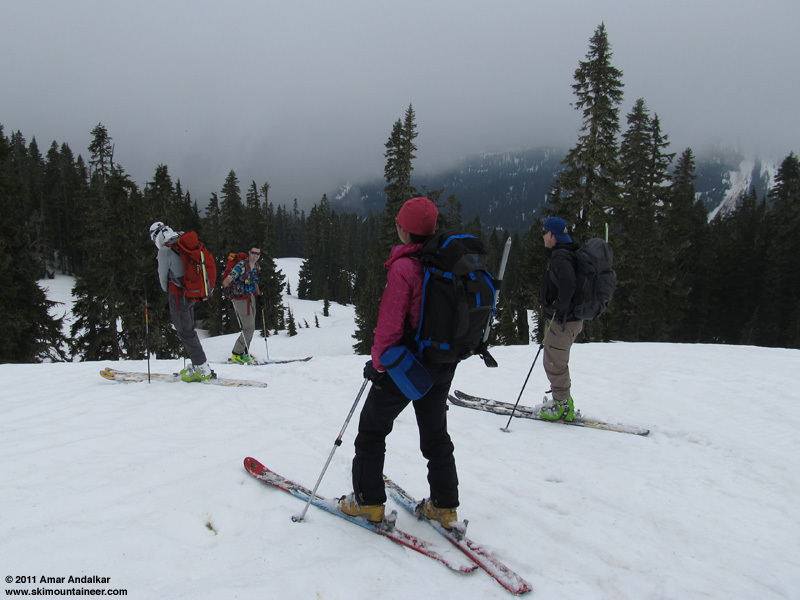 The traverse around the summit dome to Grant Peak was done in intermittent whiteout and sunshine. 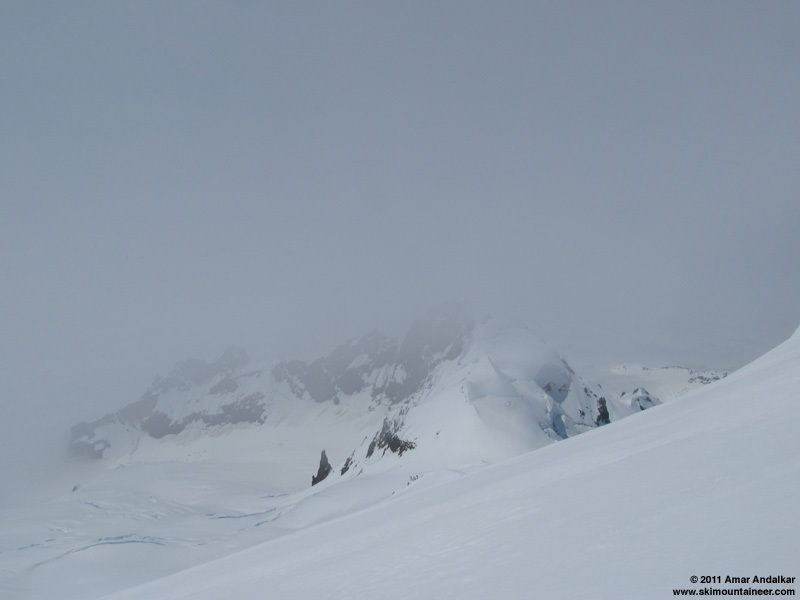 We arrived atop an empty Grant Peak at 1:30pm, with temps in the 20s F and very light winds, with occasional glimpses of Mount Shuksan as the cloud deck thinned and reformed. Traversing to Grant Peak through the mists. We saw an object which looked like a pack lying a hundred yards to the north atop the Park Headwall, and I speculated that it was probably Dan Helmstadter's, only half in jest. We hung out for a few minutes, hoping things would clear up, when who should arrive climbing up through the mists but Dan the Man himself, having skied the Park Headwall down to the bergschrund and cramponed back up, and now planning to head over to the Coleman Headwall. Unfortunately, I completely forgot that it was Dan's birthday, else we would have sung "Happy Birthday to You" on the summit. We also forgot to ask him to take a summit photo of our group, so we have none. 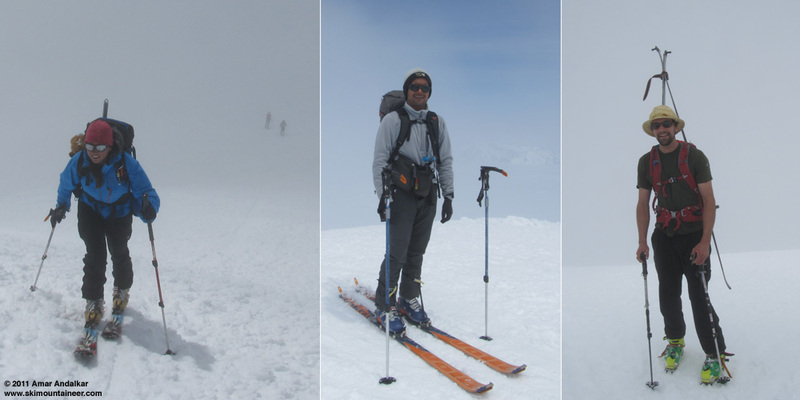 A small selection of the characters seen atop Mount Baker this day. We left Dan up there and skied down at 2pm in a complete whiteout, traversing around the shoulder of the summit dome and feeling our way slowly down the Roman Wall using a combination of the skin track and my GPS. A shame that we couldn't fully enjoy the sweet smooth snow on the Wall. We finally dropped out of the upper cloud deck near 10000 ft, and were soon in the bizarre situation of skiing in bright sunshine between a pair of cloud decks, the upper edge of the lower deck having slowly risen up to about 7000 ft and the lower edge of the upper one hovering near 10000 ft. 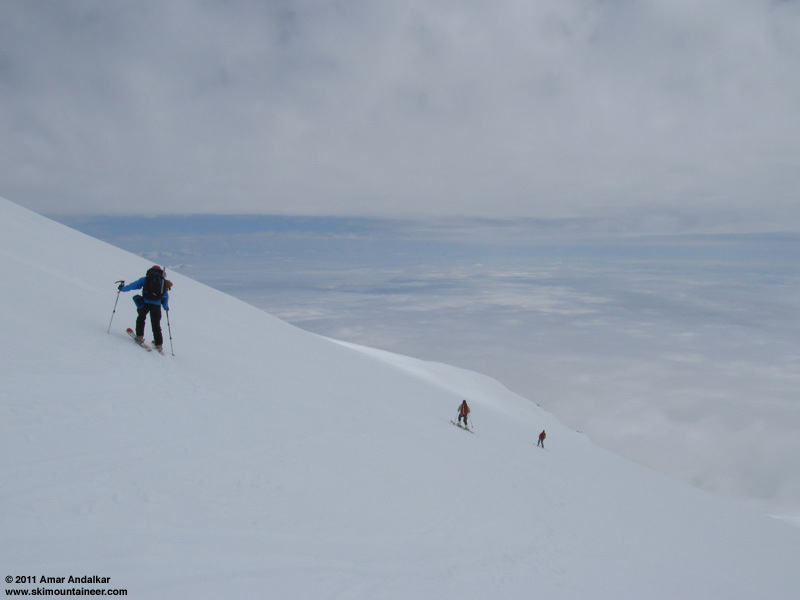 Skiing between the cloud decks. The snow quality rapidly degraded below 9500 ft, becoming softer and mushier and more unconsolidated. By 9000 ft it was deep mushy glop, we were trenching 1-2 ft deep during turns, and stability would have been a serious concern on any steeper slope. The snow got somewhat better below 8000 ft, with fun turns possible even on my 70mm-waist summer ski mountaineering setup (no choice for me, due to the fatal damage to my 88mm-waist skis on the Rainier trip), but much wider skis were definitely the right tool for this stuff. 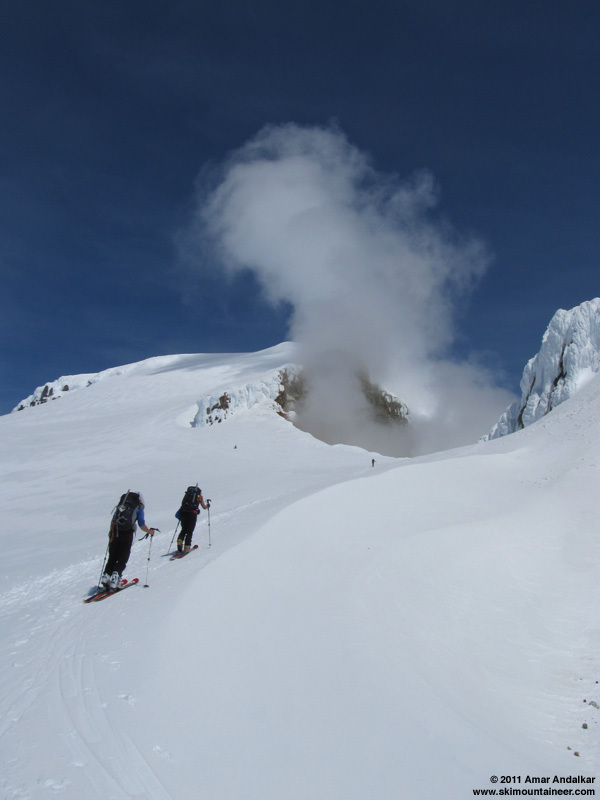 Carving turns in the mush below 8000 ft on Squak Glacier. By 7000 ft, we had dropped into the lower cloud deck and another complete whiteout, luckily we could follow our skin track with help from the GPS track. About a half-hour of slow motion in the whiteout before we finally dropped out the bottom of that deck, glad to be able to see at all but sad that we'd see the sun no more this day. A dirty grind down through the forest, with smoother skiing only if following the tracks of a previous skier, and then the long skate, slide, and carry out the road brought us back to the cars just before 5pm. Almost 12 hours on the day with about 5 hours up in the sunshine. A really fun day despite the challenges of three separate whiteouts and all that mush. It was great to enjoy some sunshine and ideal weather (not to mention some welcome peace and quiet) for at least those few precious hours up above the clouds on the Great White Watcher. Thanks for combining so many great trips with great write-ups. Being sidelined with injury till next season, it is great to have such detailed reports. Like skiing from my computer.